Most of the time when people are talking about XP they are referring to either their Call of Duty Prestige or in most other cases they are talking about leveling up their characters in a Role Playing Game. This can be seen in many games from World of Warcraft, Diablo, Final Fantasy, Skyrim, Borderlands, etc. 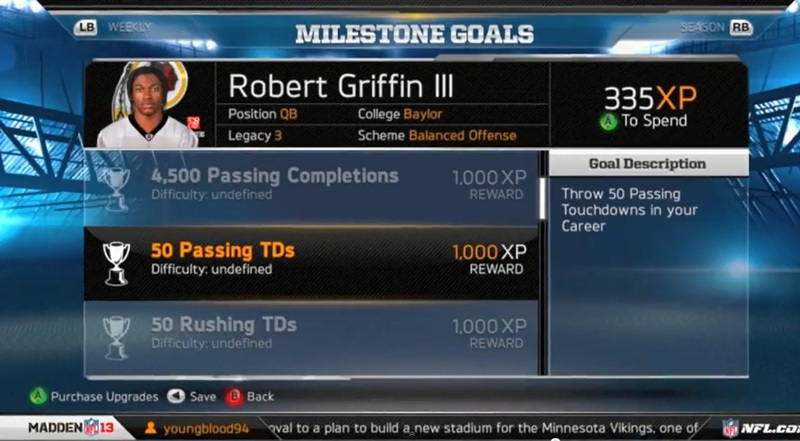 However, for the first time ever you will be able to do this in Madden NFL 13. This might not seem like a big deal to people that play online pick-up games, but when it comes to Franchise Mode (now called “Connected Careers“) this is something that has been sorely needed for a long time. Why would this be such a drastic ‘need’? The answer has multiple levels and we will cover them. XP works in such a way that your players will earn points for you to spend (like currency) on improving the player as you see fit. While this is something that some people might have a beef with because it allows the gamer to do something like make JaMarcus Russell into an amazing player if they build enough XP. The answer to anyone that has a problem with this is simple and it is the first big reason to applaud this new system of progression. It will take time to build someone into a superstar – Even players like RG3 are going to take some time to develop into the attributed monster you want them to become (that certainly goes for anyone looking to build JaMarcus Russell or Brady Quinn into anything near a 90 OVR player. You control your team, it is (almost all up to you) – There isn’t really an excuse for your best players to not progress at this point. The power is in your hands to get your wanna-be diva WR the ball more often if you want him to level up. Want your QB to have more XP, don’t throw the ball into coverage all the time. Longevity is finally here -For years, practice mode has been a wasted effort to even put in the game. This year you can practice with your players and get them even more XP by doing this. It makes sense, but we advise against asking Allen Iverson about how much you can gain through practice. It is time to start getting excited for football season in gaming. For the first time in years, we really have something to talk about that isn’t how bad Madden is… but how good it could be. Next Next post: Is Battlefield 3 The Swan Song for EA’s First Person Shooters?